The user has the option of selecting a lens they have on hand for this camera, or purchasing a lens from us. Thanks to the front end camera design, this procut can take an insustry standard C-mount or CS-mount lens equllly well). Lens flexibility is a hall mark of good camera design. Sens Up - Digital slow shutter speed is easy to set using the OSD menu. 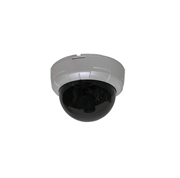 Motion Detection - Create up to 4 on-screen trigger zones with adjustable sensitivity. Trigger an alarm when motion is detected in one of the zones, using the GND/In/Out terminals on the back of the camera. White Balance Programming - Increase accuracy of color reproduction by fine-tuning color temperatures. Indoor & Outdoor setting available. Privacy Masking - Place a gray, white, or black mask in up to 8 different on-screen positions to prevent invasion of privacy concerns and liability. Any action covered by a mask can not be viewed or recorded. C or CS- mount lens compatible (C-ring provided) - lens NOT included. Click here to contact us for specifications, availability, and wholesale pricing on this product!